Yesterday I wasÂ privilegedÂ with spending the morning talking to custom cable designer Alex Sventitsky of WyWires, LLC. Alex focuses on a simple and elegant design approach, and believes that a system can be greatly improved with correct cable matching. Â And as such each cable is custom made to fit a system and need, and only sold after careful consultation. In homage to Thomas Edison and Nikola Tesla, Alex focuses on ‘getting back to basics’ design approach. Â Un-shieldedÂ cables that erode as little of the signal as possible. Â WyWire cables are made of ultra pure copper strands, coated in inert lacquer, and braded in a proprietary fashion. Â WyWires uses organic cotton as a dielectric material. Â Each cable is then housed in a Teflon tube and wrapped in a very easy to manipulate material. Â The key characteristic of a WyWire cable is low impedance with very low inductance and capacitance. Â This opens up subtle details and helps to create a clearer stage.Â Â Each WyWire has a specific design and system in mind. Â Because the voltage output of a CD Player maybe many times higher than the voltage output of your moving coil phono cartridge, each cable is designed to fit a specific application. Why noÂ shielding? Â Isn’t this going a bit too much against the grain. Â Shielding materials can erode the original from the original signal and then release back into that signal at a later time, smearing the signal and thus the sound. Alex’s price points are varyÂ reasonable considering some of theÂ monstrousÂ prices of the cables he is in competition with.Â Â Alex aims for recreating the liveÂ experienceÂ in your home. Â Often getting out to local shows in the LA metro area he is constantly using live instruments as hisÂ referenceÂ points. A very nice guy who is down to earth and easy to talk to. Â He makes a great cup of coffee and is a very welcoming guy. Â His current system is very good sounding and doesn’t cost hundreds of thousands of dollars. Â A good stage and deep blacks. Â Drums , guitars and vocals where especially dynamic had a very realistic timber. Find out more about WyWires at www.wywires.com. Â You can go straight to the Technology Paper PDFÂ here. 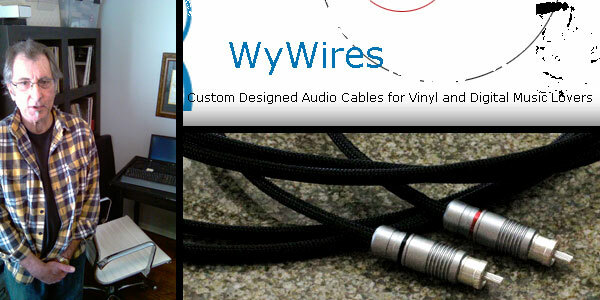 Look for an upcoming review of WyWire cables on AudioReview.com.